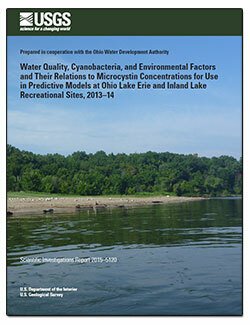 Estimating Microcystin Levels At Recreational Sites In Western Lake Erie And Ohio. A new article, published in Harmful Algae, describes a study to predict cyanobacterial harmful algal blooms (cyanoHABs) at three Ohio recreational lake sites. A new article, published in Harmful Algae, describes a study to predict cyanobacterial harmful algal blooms (cyanoHABs) at three Ohio recreational lake sites. This is a follow-up article to a previously published USGS report. A cyanoHAB is a large growth of bacteria that produces toxins such as microcystin. Staff collected data and made water quality and environmental measurements that were used to identify factors that could be used to develop linear-regression models to estimate microcystin levels. The results of this study showed that models could be developed for estimating a microcystin threshold concentration at a recreational freshwater lake site, with potential to expand their use to provide public health information to water resource managers and the public for both recreational and drinking waters. Francy, Donna S.; Graham, Jennifer L.; Stelzer, Erin A.; Ecker, Christopher D.; Brady, Amie M.G. ; Pam Struffolino; Loftin, Keith A.
Francy, D.S., Graham, J.L., Stelzer, E.A., Ecker, C.D., Brady, A.M.G., Struffolino, Pamela, and Loftin, K.A., 2015, Water quality, cyanobacteria, and environmental factors and their relations to microcystin concentrations for use in predictive models at Ohio Lake Erie and inland lake recreational sites, 2013–14: U.S. Geological Survey Scientific Investigations Report 2015–5120, 58 p., http://dx.doi.org/10.3133/sir20155120.